1) The Port Jackson shark is one of those that if manufactured with relative anatomical accuracy, would make for the best cuddly toy ever. Assuming the toy company didn’t elect to make the fin spines out of anything sharp. The shark is an aesthetic ice-cream cone shape with a friendly face and a pleasant attitude. To really grab a child’s attention whilst sitting on the shelf in the toy shop, the Port Jackson shark also sports attractive patterns on it’s head and body. 2) The Port Jackson shark has the most amazing set of teeth, which form one of the main reasons it is classified separately from other shark species, in its very own Order the Heterodontidae. Which is a great word, and means “different teeth”. 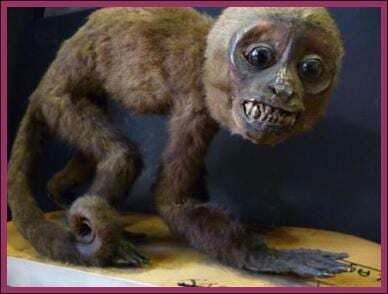 It has two types of different teeth, stout rotund ones with sharpish cusps at the front for gripping, and blunt occluding ones at the back for grinding. It chose this dental arrangement as it is (cool scientific word coming up) a durophagous predator. Which means an animal that eats ‘hard things’ such as shelly invertebrates like sea urchins and crabs in the case of the Port Jackson shark. It grinds its prey up with its back teeth. 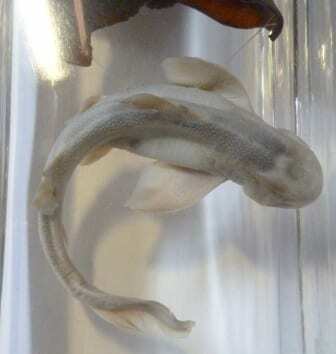 3) The Port Jackson shark grows to about a metre and a half, which the imaginary scale bar in the professionally/scientifically generated image of the specimen above will therefore indicate to you, this specimen is a pup. The dark brown thing above the pup is an egg case. Presumably the one it came out of moments before it was pickled. Actually this specimen is about 6 cm shy of the typical 23 cm hatchling length, so it is probable this little lady (no claspers) is a foetus. 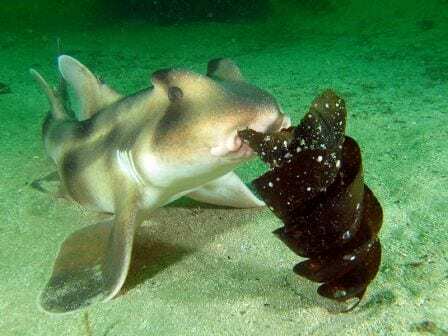 Female Port Jackson sharks (mature ones, not ours) will normally lay between 10 and 16 eggs between August and September, which take about 12 months to hatch. The egg cases of Heterodontiformes are all this interesting spirally shape, which is unique to this order. Having laid her eggs, the female will use her mouth to wedge each capsule into rock crevices, and it is thought that the spiral shape helps to keep the egg in place (shown in the image on the left). Here it receives a degree of protection from predators. 4) The Port Jackson shark is so named based on the frequency with which they are sighted in Port Jackson, Australia. It inhabits coastal reefs and can be seen most active at night time when it feeds. 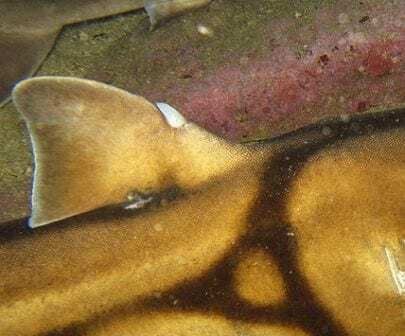 For the moment, the Port Jackson shark is relatively abundant still. Only found in Australia, they are not fished on purpose (apparently they don’t taste good), though they are often caught by accident and sadly not always thrown back alive. Port Jackson sharks are also popular aquarium exhibits though as they can be bred in captivity, the need to catch wild ones is not high. Thankfully.